Tanks join Iron Dome batteries along Israel's northern border, following airstrike which killed senior Hezbollah, Iranian commanders. 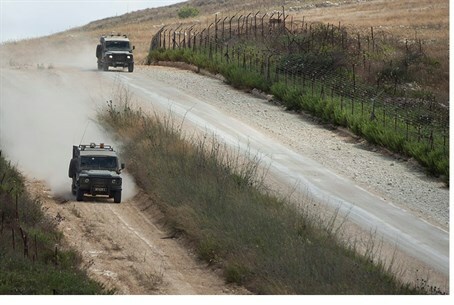 The IDF has closed the old road between the towns of Avivim and Dovev in the northern Galilee, due to their close proximity to the border with Lebanon, in the latest sign of rising tensions in northern Israel. Likewise the road between the moshav Zar'it and the Lebanese border was closed as well. IDF forces have been on high alert since Monday, when an IAF airstrike in the Syrian Golan Heights killed a senior Hezbollah commander and an Iranian Revolutionary Guards general, along with several other Hezbollah and Iranian fighters. Iran has since vowed revenge for the strike, and Israeli soldiers stationed along the northern borders with Syrian and Lebanon have been placed on a heightened state of alert. Later on Monday, Iron Dome missile defense batteries were deployed along the Syrian border. Apart from the road closure, on Tuesday tanks and armored personnel carriers were also deployed along the northern border, and Lebanese media outlets are reporting Israeli jets and helicopters over the Har Dov area along the Lebanese border. Earlier in the day, a senior IDF official told Reuters news agency that airstrike - which Israel has not officially claimed - was never intended to take out the two senior Iranian and Hezbollah commanders. The official claimed IDF forces were responding to what they thought was a squadron of low-level Hezbollah terrorists preparing to launch an attack against Israeli soldiers stationed at the border, and ordered a preemptive airstrike to stop them in their tracks. "We did not expect the outcome in terms of the stature of those killed - certainly not the Iranian general. We thought we were hitting an enemy field unit that was on its way to carry out an attack on us at the frontier fence," the source related. "We got the alert, we spotted the vehicle, identified it was an enemy vehicle and took the shot. We saw this as a limited tactical operation." But another senior Israeli official remained tight-lipped, saying only that "the State of Israel will not relate to the incident in Syria or to reports concerning it - reports which did not come from qualified sources." "Israel's policy was always and will remain to thwart any attempted terrorist attack against her," he continued.